Rick: The theme of the campaign is “brotherhood.” What does this mean to you? Doug: For me “brotherhood” means “through thick and thin magkakasama tayo." You’re more than just teammates. Over the course of a year or even during your entire college stay, you spend more time with your teammates than even your family. So you develop a bond. You learn to trust each other in life in and outside of basketball. And when the game’s on the line, you rely on each other to cover everyone’s back. You look after each other no matter what. Rick: Does being a brother to another player mean more than just being a teammate to you? Doug: Being a teammate means basically you’re just there to play with him. But being a “brother” means you’ll always be there kahit mapaaway kayo, kahit may problema siya. Kahit wala yung confidence niya sa game – you try and help him regain that. Basically it means helping each other out no matter what. 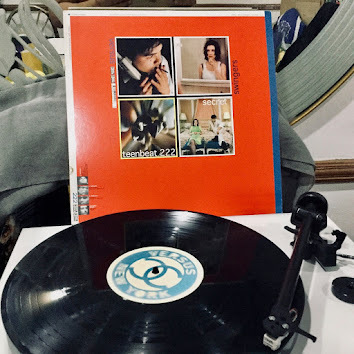 Rick: Growing up – not that you’re old already – was there a “big brother” for you? It could have been a teammate, a coach, a classmate, a professor, a friend or even family member. Doug: For me, in these last few years, more than anyone, it was coach Norman (Black). He was both a brother and a father figure to me. He really helped me one on one especially in my third year when I was struggling. He really took time out of his schedule to help me grow. Not just in terms of basketball skills but also by following up on my studies. He really helped me get through and achieve my potential. Rick: “It’s not about me but we.” It’s adidas’ creed or team concept. Do you subscribe to that and if you do, why? 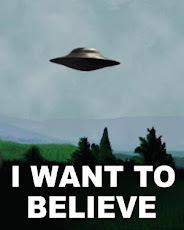 Doug: I believe in it. For you to take part in a team sport you have to believe in it. Basketball is not about an individual. Everyone has to chip in. You cannot score 100 points a game and be successful. It takes more than scoring to win a game. There’s a reason why there are five of you on the court. You have to help out in playing defense and rebounding. In setting up plays or even by just contributing to the hustle stats. If your goal is to be individualistic where you’re after awards or scoring records, you’ll be recognized for that feat, but they’ll respect you more when you jell with the team and through that turn the team into a winner. 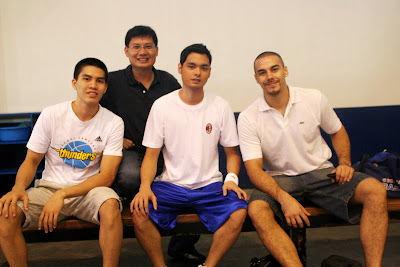 Rick: Was there a “brotherhood” moment for you during your time in Ateneo? Doug: During my last year we had a lot of instances and opportunities to show our camaraderie. Sobrang brotherhood. How far we’ve grown as a team or as a band of brothers. I’ve never been closer to any team than the one I played on in my final year. After losing our first game of the eliminations even the championship, walang nagsisihan. We consoled each other in the dugout and promised to carry on what we’ve learned in our time together. Even for us who graduated, we would attend the games to show support. We knew we gave it our all during last year’s finals. And it was a successful season for us despite the outcome. We were proud of what we accomplished in spite of not meeting the ultimate goal. Doug: It's okay naman with Air21. Very professional. And everyone gets playing time so you know you're going in no matter what. You just have to be prepared. I haven't been taking too many shots. I try to play defense and get some rebounds. But I hope to have that breakout game soon. Doug: No matter what the problems one has they all come to practices and the games plugged in. We don't really mind each other's problems unless they bring it out. We don't have kantyawan of any sort about our playing days. We joke and tease each other about other stuff, but the college stuff... well hindi naman. Doug: It's a job now, man. You miss playing for Ateneo and all the cheering, the big crowds. Yeah, if I could do it all over again, I'd play for the school once more. Doug: So far Rico or any of the others haven't given that "welcome to the PBA" treatment if there is one. It felt strange at first being on the court with them and they were wearing a different uniform. The Moro Lorenzo Sports Center in the far end of the Ateneo De Manila University campus is a little noisy even if school’s out for the semestral break. The university’s track and field team is doing some laps up above the indoor track oval. There’s the squeak and whacks of shuttlecocks from a badminton game close by. By the Maplewood basketball court that dominates the massive training facility, a lone voice whips a newly formed basketball team in motion. Kevin White, a Fil-Am from Los Angeles, California has only been in the country for several months but he commands one squad as if he was born to do it. On the other team is his opposite number, Marcy Arellano late of the UE Red Warriors. It’s practice for the Mail and More squad’s inaugural season in the Philippine Basketball League’s V-Go Extreme Energy Drink Cup yet they already boast of some stars from the recent and past UAAP wars in Arellano and his UE teammates Kelvin Gregorio and RJ Masbang, the University of Santo Tomas’ Mark Canlas, Far Eastern University’s Mac Baracael, and University of the Philippines’ Mike Bravo and Woody Co among others. The team is coached by Allan Gregorio. Team assistant coach Mark Jomalesa tells White to try speaking in his passable Filipino, but White smiles and laughs, “No, in English.” His teammates laugh and they take a break. More skeds to be posted over next few days folks! What? No, Bulls games? Come on, Relster! THE THEME OF THE CAMPAIGN IS BROTHERHOOD. TELL US WHAT BROTHERHOOD REALLY MEANS TO YOU. You know, it's a group of guys that whatever their status is, is out the window. I know they're just one group; they fight for each other. They go to war with each other. You know, they have fun with each other; they go up, down with each other. That's what a brotherhood is, just that trust. You know, that's a family. You know, they're not, that's my friend, or that's my family and that's what a brotherhood is. DOES BEING A BROTHER TO ANOTHER PLAYER MEAN MORE THAN JUST BEING A TEAMMATE TO YOU? Yes, yes. When you have that bond with that player, guys have been through the trenches together, you know, it's not, "he's my teammate any more.” It's "that's my loved one; that's my brother; that's who I fight for." So if anything happens, that's my brother. I'm going to help him out. People see teammates and brotherhood are two different things. Teammates come in and out of your life. Brotherhoods is those people that you bonded with, that you're always going to have that connection for. BROTHERHOOD CAN MEAN MENTORING, COACHING AND TEACHING. WHO ARE SOME OF THE PEOPLE THAT ACTED LIKE YOUR BROTHERS OR YOU REALLY LOOK AT LIKE THEY TOOK GOOD CARE OF YOU WHEN YOU WERE GROWING UP? So I have friends I grew up that's brothers; I got people in college that's brothers; and I got people that I met in the NBA that's brothers to me, and you know, you just you know, you just have a brotherhood. All you guys get along. You know, even if you fight, you still, you know, you guys have something more than what you are. "IT'S NOT ABOUT ME, IT'S ABOUT WE.” DO YOU BELIEVE IN THIS IDEA, AND IF YOU DO WHY IS THAT? Yes. You know, you can win a game. You can win a scoring title. You know, you can hit a game winner. You can't win a championship. It has to be a "we" thing. It has to be a group, and you know, it's been proven year after year, after year. Even the greatest player in the world can't win it by himself. He needed a group, and you know, that's where that family comes in. Those teams that get along the best always win the championship. TELL A STORY ABOUT A BROTHERHOOD MOMENT IN YOUR CAREER THAT HAPPENED EITHER ON OR OFF THE COURT. I threw a New Year's Eve party at my house, because I didn't want my teammates to go out and get in trouble, you know, out in the parties. So I had car service pick up food, DJ, everything. Every single one of them showed up. It was probably 200 people in my house, and it was just, we had fun, but it was more that, you know, we're all here together. I didn’t have to worry about anybody, every single one of my teammates. My family is safe, and it was just a special moment. I was more of the goofball in the campaign. You know, it's fun. 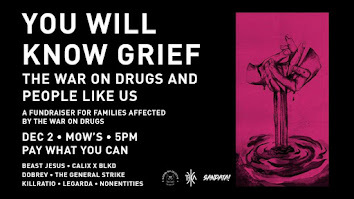 CAN YOU TALK ABOUT YOUR GUYS' INTERACTION AND TALK ABOUT THIS CAMPAIGN A LITTLE BIT? You get 12 different strangers together, just like a team. Twelve people who don't know each other; you get twelve kids. You know, they live in a dorm; they come in as individuals, but when they leave, they're leaving as a brotherhood. Like KG was telling them, when you guys go off in your own worlds, you guys are going to always remember each other. You know, just because of this day right here. GETTING THE SIX OF YOU TOGETHER, I SEE HOW WELL YOU GUYS GET ALONG WITH EACH OTHER. CAN YOU TALK ABOUT YOUR GUY’S INTERACTION? It's kind of funny, because, you know, you normally wouldn't talk to somebody like KG on the court, because his demeanor. Each one of the guys have your own demeanor on the court, but then when you put us in the setting, and it's like, oh, what's happening? How you doing? You tell stories; you have fun about the season. 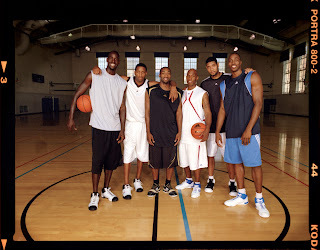 I met all these guys through adidas. I got to know Chauncey. I know Tim. So, you know, it's easier for me to go to them now, 'cause before, you know, you're nervous. Like, oh, you know, that's Tim, that's KG. You can't talk to them. YOU ARE THE SECOND YOUNGEST PLAYER IN THIS COMMERICAL, WHAT IS THAT LIKE FOR YOU TO BE IN A COMMERCIAL WITH GUYS YOU FOLLOWED BEFORE YOU CAME INTO THE LEAGUE? You know, it is so weird that you say that, because I remember when I was in high school, and they were getting drafted; I was putting their posters on my wall. Now I'm sitting here in a commercial with them, you know, part of their group. It's kind of weird. He was a star in the waiting even when Thierry Henry was still with the Gunners. I knew that in spite of the Frenchman's departure there would be no drop off more so since they have a talented team. 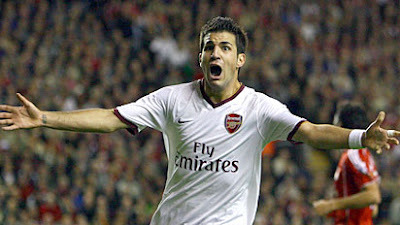 Now that the offense is a little more spread out, Cesc Fabregas has emerged as a scoring force. They tied Liverpool, but how can you not feel for the Gunners? They played with more flair and heart (which is more than I can say about the Reds). They just never gave up and got the badly needed equalizer to send them back to the top of the EPL standings. Over the weekend, candidates for future thieving bastards the barangay elections made their last pitch. One of them, wearing a golf shirt that didn’t do much to hide his potbelly, went up to my apartment and introduced himself. When he learned that I was a sportswriter, he immediately pumped my hand and asked for future free mileage as he planned – if he won through vote buying and cheating in the elections -- to steal the people’s money organize summer tournaments for the youth. I thought back to when I was working for Solar Sports when I met up with a incredibly wealthy politician who championed the cause of one sport because he believed it was an arena that could catapult the Filipino into world-class status while increasing his profile for the next elections. He said his ill-gotten wealth money wasn’t a problem in supporting the athletes since it wasn’t his to begin with and he would spare no expense to help them get the best possible training and equipment. I was immediately put off by how he managed to acquire so much money and his callousness in flaunting it impressed by his generosity and patriotism that I pledged to pillory him no end support him in any way I could. There’s nothing quite like covering sports and lambasting its villains. To paraphrase ABC Sports -- it’s great to span the globe to cover the thrill of victory and the agony of defeat caused by damn referees and cheaters. Besides you get inside the venue for free with a front row seat and hear all the back room talk about what really goes on inside to all the in-your-face action. One of the fun aspects of covering sports is that you get to meet a lot of these athletes some who are swell-headed braggarts who believe that their fame gives them free pass to everything who are such great persons and should be proper role models for the young. Some like our Mt. Everest climbers were instantly hailed as crazy attention-seekers by pessimists trailblazers. When they were looking for corporate sponsorship they were largely ignored yet once they reached the summit, everyone and their brother wanted a photo op with them welcomed with open arms and their feat turned them into instant national heroes. Of course, sports isn’t without problems. Tennis is in the midst of a major gambling investigation yet it was certainly heartwarming to hear the sport’s governing bodies – the ATP, WTA, ITF, and the Grand Slam Committee quoted a British bookmaker who said that match-fixing will never be stopped proclaim that they’ve got the problem well in hand. But I’m confident that sports will not overcome its problems because there’s too much money, power, and prestige at stake. In the case of the NBA, Commissioner David Stern said that referee Tom Donaghy’s arrest for gambling and match-fixing was the tip of the iceberg with reports indicating that more than half of the league’s 56 violating gambling policies an isolated one. 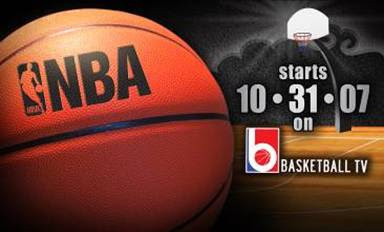 Nothing that the world’s greatest basketball league and bettors can’t game fix once the new season’s action gets underway. Speaking of basketball. Right before the new PBA conference tipped off, one team was trying to trade for a long-time veteran of another club who has been riding the bench of late. But before the trade could be consummated, the other team backed out citing that they’d rather keep the player because they were afraid that the player would come back to haunt them so they’d rather bury him at the end of the bench felt that he could still help their club. It is a business after all and we can be ruthless if we want was a no-brainer, one team official said. The player is said to be extremely pissed ecstatic about remaining with his team and his goddamn coach. One of the most eagerly awaited sporting events are those international in scope where due to negligence and selfishness many of our ill-equipped athletes fail to make a good account of themselves. Those who win medals are promised lavish amounts of money that they almost never see justly rewarded for their feats while the losers others are ignored and left to get their own ride commended for their efforts once they arrive at our dark, gloomy, and antiquated beautiful and world-class international airport. Some like Manny Pacquiao have become national treasures whose daily life is reported regularly by some stalking media types big news for people who think that gossip makes for great news reporting would like to know more about the Philippines’ one true global icon. The sports page because of the variety of its scope of games and matches and scandals as well is for many people the first section they read when they pick up the newspaper. And that is why I write about sports because of the notoriety of having a column and seeing my mug in a national broadsheet and that there may be a possibility that my newspaper will one day send to Europe to cover probably the best football club in the world Liverpool FC these are the games that define us and the great times we live in. 1. It's in the works -- hush hush they say -- a Nike commercial featuring LeBron James and Maria Sharapova. 2. The new Yankee Stadium -- I'm sure they'll be raising ticket prices. But I'll be there when it opens, bubba! 3. If the Texas Rangers paid Alex Rodriguez $252 million my guess is the Yankees will break the bank when they attempt to re-sign him. 4. So it comes down to Don Mattingly and Joe Girardi. As much as I like Donnie Baseball, I wonder if the Yanks' need a kick in the pants with Girardi. The problem is, he played with a few of these guys. Will they respect him? A few were called up from Triple A in '95 to play in Donnie's last year, but that doesn't count. He was -- along with Dave Winfield -- the team icon during the 80's. 5. Do the Chicago Bulls finally trade for Kobe Bryant. It's a tantalizing offer, but the Lakers are asking for too much. But think about it? Check out some of our Grade School Readers! These kids are the twin sons of Anton and Chona Concepcion -- Anton and Juan-C. 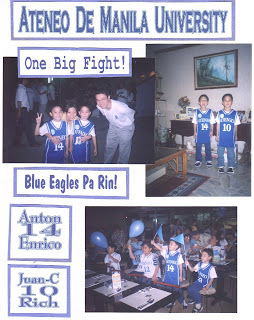 They're devoted Blue Eagle fans and readers of the blog. More responsible reporting coming up, folks. Sorry I couldn't answer the questionnaire in Filipino. 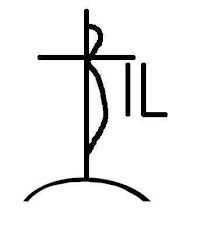 Had to ask someone to translate it for me. Thanks for reading anyways. Poll Results - Which Atenean-reinforced PBA team will win? Magnolia was the runaway choice with 36 votes. Ginebra was a far second with 5 votes. Three voters thought that other teams would win. Red Bull had one vote of confidence while Air21 had none (for shame)! Incidentally, Magnolia tried to trade for JC Intal but Air21 said no. Thanks for joining the poll, folks! Thanks to adidas Philippines for this picture. We'll be featuring more stuff on the Brotherhood campaign as well as it's local component over the next few days. Sorry I haven't been able to really update the blog coz I just transferred apartments. But next week though. THE THEME OF THE CAMPAIGN IS BROTHERHOOD, WHAT DOES BROTHERHOOD REALLY MEAN TO YOU? Brotherhood is having a friend or a teammate or someone that you look at like a brother and really, really believe that and solidify that with not just what you say but how you treat them, how you interact, the loyalty you have for them, all that, solidify the brotherhood to me. DO YOU THINK BEING A BROTHER IS MORE THAN JUST BEING A TEAMMATE? AND IF SO, HOW WOULD THAT BE? I definitely believe that being a brother is probably more sense of brotherhood more than having a teammate. You know, you can have a teammate, but when you have a brother, you know the ins and outs of them, their favorite color, things they like to do, the similarities between the two, the differences between the two of you, when you have a brother, it's more detailed. Teammates could be anybody; brothers are more solidified in detail. BROTHERHOOD IS MENTORING, COACHING, TEACHING. IT'S NOT JUST ON THE COURT, IT'S NOT JUST OFF THE COURT; IT'S A COMBINATION. WHO WERE THE PEOPLE IN YOUR LIFE THAT WERE YOUR, QUOTE, UNQUOTE, BROTHERHOOD? My boys were, Pugs been my best friend since we's four, and if I can think of any kind of brotherhood that I have, it would be with my friends. We don't consider ourselves friends; we consider ourselves brothers. When we see each other, we hug, you know. When we speak to each other, it's from the heart and sincere; it's purity. You know, friends or associates sometimes follow on the act of, you know, occasional hey, speaking, keeping moving. Brothers are a way of life, you know? You see that person, you talk to that person on occasions, and you know, they come into your home, you come into their home; there's a lot more detail. A LOT OF PEOPLE LOOK AT THE NBA AND THEY THINK GUYS ARE KIND OF OUT FOR THEMSELVES. I NOTICED WHEN YOU CAME IN AND YOU SAW DWIGHT FOR THE FIRST TIME, YOU CONGRATULATED ON HIM HIS NEW DEAL. CAN YOU KIND OF TALK ABOUT THE THINGS THAT PEOPLE DON'T SEE THAT MAKES THE LEAGUE MORE OF A BROTHERHOOD INSTEAD OF JUST A BUNCH OF INDIVIDUALS? Well, I feel like in this league we have a lot of followers. We have younger players that it's very, very important to show them that or at least be a good example. I feel like there's not enough good examples on how it should be. First there's the part of it, and me congratulating Dwight and Chauncey on their new deals, and you know, hoping for the best for their futures, not just with economics, but with health and family. By me doing that, it's a good example for them. You know, they probably look at me, and Chauncey knows me personally for a long time. He knows that I don't really deal with a lot of different people, but as I get older and probably a lot more mature, you know, I don't have a problem expressing how I feel about someone. I've had veterans in the past, you know, congratulate me from when I made different accomplishments. So it's no different from how someone once treated me. So, you know, when it comes to Dwight and those guys I just want them to know that as a person, an opponent that plays against you, I still got love for you. You know, and I am genuinely happy for you. IT'S NOT ABOUT “ME, ITS ABOUT WE.” I KNOW YOU'RE A GUY WHO BELIEVES IN THIS. CAN YOU TELL US WHY? Well, I really, honestly, I know that out of all the accomplishments I made in the league, I couldn't have done that without the other four guys, the other guys on the bench, or whatever. You know, when you’re successful and you're just so happen to be the one that gets the attention for the success, you know, a lot comes with that, and that's responsibility. But I've never once, you know, I'm 31 years old, I never once put myself above the team. Everybody wants to be the superstar, but don't really understand what comes with that, and what comes with that is appreciation for the other guys and respect for the other guys. You know, yeah, you set the tone; you're the example in which they follow, but at the end of the day, those guys make you better, just like you make them better. CAN YOU GIVE US A STORY ABOUT WHEN YOU CAME IN THE LEAGUE OR RECENTLY WHERE THE IDEA OF BROTHERHOOD CAME INTO PLAY? I have a couple stories. The one that sticks out is one time we were having plane trouble, and we had a back to back. We had a game the next night, and at the time, Flip was our coach, and he was trying to figure out a way to get everybody calm, because we were starting to not panic, but, you know, we're in the playoff race where games are probably even more important . So, I took everybody and I said, “hey.” I made a phone call, spent my own money and got us a plane, but just for the players. I got A through Z, from the 15th man all the way up to myself; we got us on the plane. We flew to Seattle and won the game from Seattle and then we took the plane and went home that night. And I was very respectful of the coaches, but I told Flip that, you know, if he wanted to, he was welcome to, obviously, jump on the plane, but I'm going to take the 15 guys and we're going to get on this plane, we're going to win this game tomorrow, and we did, and we're going to go home the next night. I just remember Mad Dog's face and the whole bunch of different teammates that were standing out, and they was, like, this is how you do it here. Like, I can just see how they looked at me. It wasn't about anything else. At that point then, nothing mattered to me but those guys and their health and their well-being. I didn't want us to be at fault, so I wanted us to be together. I wasn't going to have, you know, four or five of us fly and be over here. I took the whole team. And we had steak and potatoes and everything that you can dream of that could be on the plane; they had it real lavished and laid back and had video games on the plane; it was beautiful. I just remember everybody's face and how they was looking at me like, wow. You know, that's the story that sticks out to me when I think of brotherhood. It's kind of a lavish story, but it's a story that I look at that, you know, the last person on our team he didn't leave me out, or you know, he included me. I really feel like, you know, KG's my brother. That's one of the stories that stick out to this day. ALL SIX OF YOU ARE ALL-STARS; ALL SIX OF YOU ARE SUPERSTARS. YOU COULD EASILY LOOKOUT ONLY FOR YOURSELVES, WHY DON’T YOU? WHY DO YOU TAKE THE IDEA OF BROTHERHOOD TO HEART? I feel like how you treat others is really your personality. I never get into what somebody else is doing. I've always had a hard enough time dealing with what I do and keeping up with that. But, you know, my demeanor and my personality is to make everybody comfortable. I've been the youngest amongst older guys and been hazed and, you know, kicked around. My first day in camp, man, I got into about two or three fights. I was just tested from that day throughout the camp, and I'll never forget after that first day I was so livid and hot and I was just like, you know, really feeling isolated. I can remember the third day of camp getting into these altercations and stuff. Matter of fact, right after the camp we had our first game against Milwaukee, and Sam Mitchell and Doug West was hazing me and giving me a hard time. I'll never forget playing in a game and somebody had did something to me, Sam Mitchell was the first person to jump up and say something and got in the dude's face, and that sort of took me back a little bit to, like, yeah, okay, they do got my back. It just solidified for me that, you know, okay, fine. That was the example set right then and there like I don't care how much you fight amongst each other, we hit this floor, we are out here together, and if not, you take that jersey off and get the hell up out of here. I've been cool with that every year I been in the NBA. LET'S FOCUS ON THE CAMPAIGN. TALK ABOUT WHAT YOU'VE DONE IN THE CAMPAIGN AND HOW THAT HAS KIND OF FED INTO THE BROTHERHOOD IDEA. I'm the glue that keeps it all together if you will. If I was to take a position in this whole brotherhood with Timmy, Chauncey, those being the ring leaders, Mac, Gil and Dwight being, the crazy talent and the most skilled talent, I'm the glue. Out of this whole thing I don't consider myself a vocal person, but I will speak up when I need to. Chauncey's probably one of the leaders here; he's a natural leader; I know him, but he's not as vocal as I am. So knowing that he has the expertise in winning, him and Timmy, that they’re going to speak when they have to, keeping everybody loose, understanding what we got to do here. We play with the kids, and I just basically, you know, said a couple of things to let them know why we're here. We're going to have some fun, but at the same time, let's get something done, and that's my role here. My role here is to make sure everybody's not only relaxed and understand what's to be done, but at the same time to enjoy it and mess around a little bit. Because the kids looking at us, like we were stars in the sky, I was just trying to, you know, get them to understand that we was once like you being young, so this is a dream. If you have anything you want to say, if you've got anything you want to ask, ask it. I guess I look at myself in this whole campaign as confidence, because the kids they really don’t know how to go up to Gil and say, "Hey, Gil, I mean, I love your game, you know?" You know, so many kids not only have the ego, but they don't know how to actually approach somebody. So I was like, hey, Gil, this is such and such. You know, he likes your game. And then you'll see Shorty open up like, “Yeah, you know, I live in such and such, and I watch you all the time.” So I'm the glue. YOU HAVE DONE A NUMBER OF COMMERCIALS OVER YOUR CAREER. DO YOU FIND IT'S MORE FUN TO COME TO A COMMERCIAL LIKE THIS WHERE YOU HAVE MULTIPLE GUYS TO WORK WITH AND HANG OUT WITH, OR DO YOU FIND THAT THE INDIVIDUAL ONES ARE MORE APPEALING? Individual ones are actually the hardest. Having guys of this caliber and different guys that have actually succeeded in this league and done some major things in this league makes it easy on me. If anything, I look at Timmy and Chauncey, you know, for guidance in this whole thing. Mac and I, we share a common bond in trying to get out of the first round and trying to do different things in the playoffs. So in a way, they're like our vets in this whole thing. But I'll take the group over the individual, because it's a lot more relaxed, and it's a lot more fun, to be honest with you. ON THIS SHOOT, WAS THERE ANYTHING THAT HAPPENED, ANYTHING FUNNY THAT MAY HAVE HAPPENED THAT MAY NOT HAVE BEEN CAUGHT ON CAMERA? I'm going to tell you something. I've been in the league a long time; this is my 13th year coming up. Out of all the commercials I've done, this is by far the most fun I've ever had in shooting a commercial. This don't even really feel like no commercial. The fact that the little kids was hungry kids, not just a bunch of kids that we cast and they told them what to do. No, they treated these kids like real campers. These kids had no idea what they were getting into. The fact that you had the guys - Chauncey, Timmy, Gil, Dwight and Mac - coming in here and opening up, being really, really vocal, social, this is, hands down, the best campaign I've been a part of. I'm just honored to be here, to be honest with you. I've had the most fun in these last three days in shooting this than I have in a long, long time. The Blue Eagles have played 3 games so far: 129-51 vs Mindanao State University, 83-36 vs Foundation University - Dumaguete, and 92-51 vs Colegio de San Agustin - Bacolod. Team A is joined by Gonzaga, Rivera and Lastimosa of Team B. The one constant in the East for the last five years is that the Detroit Pistons are legitimate NBA championship contenders. And they still are despite replacing a coach, losing a key member of their 2004 title team, and collapsing to an overachieving Cleveland team. The Pistons have made the eastern finals for five straight years; only four other teams have accomplished that (the Boston Celtics, the Los Angeles Lakers, the San Antonio Spurs and the Philadelphia 76ers are the others) feat. But that doesn’t mean anything to Flip Saunders and his Pistons. What they’d like most is to annex the club’s fourth NBA title. The holdovers from the ‘04 title team don’t have much to prove but Saunders does. He inherited a great team from Larry Brown that was on the cusp of greatness but they’ve instead had a tendency to lose focus and that killer instinct when the season is on the line. No other team in the East has been close to rivaling the Pistons’ remarkable consistency in the regular season. In the last five years the Pistons have had a regular season winning percentage of .671. Compare that to the next three best teams, the Pacers (.509), Nets (.508), and Heat (.505) and you will see that the Pistons have won an average of 13 more games a year than any of these franchises. Yet despite that, one has to wonder if the Pistons have peaked and they’re nothing more now than the Utah Jazz of the late 90’s who won their division annually, made the finals and lost before they coasted to play-off mediocrity. The Miami Heat and the Cleveland Cavaliers have derailed the Pistons in the last couple of seasons so it will be interesting to see if they climb back to the top this year. The loss of Ben Wallace, Memo Okur, and – don’t laugh – Darko Milicic were noticeable all throughout the season. When the Pistons couldn’t find a stopper in the middle they chose to outshoot the opponent; an uncharacteristic but no less effective wrinkle to the new look Pistons of Saunders. They got away with it in the early rounds of the play-offs especially since Chicago without a legit low post presence chose to jack up shots from the outside. But against the Cavaliers, LeBron James drove right through motor city well past the speed limits. Chris Webber’s passing and shooting touch helped the Pistons for sure, but at 34 years old, he just doesn’t have that athleticism that made him a marvel to watch during his Sacramento days. In fact, he wore down during the play-offs. Ditto with Rasheed Wallace who instead of mellowing seems to be unraveling. Their core is aging with an average age of 31 but Detroit has positioned themselves nicely with some young guns to take over like the energetic Jason Maxiell, Amir Johnson, and Ronald Dupree especially now that they’ve let Carlos Delfino go to the Toronto Raptors. Nazr Mohammed didn’t exactly replace Ben Wallace, but he had his moments. Still they’re one or two more scoring players away from winning it all again. Rasheed Wallace is still deadly but the play-off losses in recent years seem to be unraveling him once more. Wallace, Webber, and Antonio McDyess have slowed down, but that suits the halfcourt game that they like so much. It conserves their energy and throws uptempo offenses like the Bulls and the Cavs off synch. Just when the team has to answer questions about its aging stars, forward Tayshaun Prince suffered an ankle injury during the recent FIBA Americas tournament. Although Prince played in Team USA’s following assignment, the last thing this team needs is a gimpy kneed Prince who is all the more vital to the team’s defense since Big Ben skipped town. Chauncey Billups and Rip Hamilton are still in their prime and Lindsey Hunter still provides quality minutes off the bench. But it is important to integrate Jarvis Hayes, Ronald Murray, Rodney Stuckey, and rookie Arron Afflalo into the mix. Mr. Big Shot is fine, but Rip got banged up pretty good last season lessening his effectiveness. Other teams would love to have the problems the Pistons have. One of their biggest strengths is their mental fortitude. Now if Saunders can figure out a way to bring their young guns to play meaningful minutes it will ease the wear and tear on the vets and preserve them for the second season. This is perhaps the last ride for Webber and McDyess who have never won an NBA title. Unfortunately, the days when their teams’ fortunes rode on their broad shoulders are over. More than anything now, they have to rely on other teammates to cover their defensive problems. And that’s what Pistons basketball is all about. Now if Saunders can only get this team running smoothly. Masha might be everyone's fave (and she's mine too), but maybe chalk it up to rooting for the underdog... Elena has yet to win a tennis Grand Slam. Maybe next year after she finds herself healthy. I figure she's gotta work on her conditioning and stamina. She oft plays injured which makes it easier for her foes to pick her apart. But I don't care, am still a Dementieva fan. And of course, Elena's not bad looking either. Not since Vinsanity and T-Mac gave Canada a fearsome air force has there been much excitement bubbling over basketball in Toronto. The Raptors hope to build on last year’s gains and play-off run now that they added some talented free agents to their team. 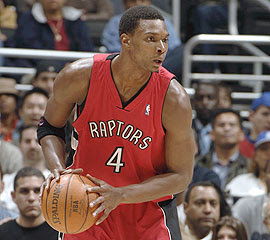 It was a moment in time for this franchise when Chris Bosh despite his young years decided to accept the mantle of leadership. It served them well in their charge to the post-season and it gave coach Sam Mitchell an opening to reach through his squad that could have very well tuned him out. The result was a 20-game improvement from the 27 of the 2006-07 season and their first ever division title. GM Bryan Colangelo must also be credited with bringing back Mitchell who received offers from other teams. The last thing a young team needs is to learn a new system while adjusting to a new coach. And Colangelo also brought in sharpshooting Jason Kapono from the Miami Heat and Carlos Delfino from the Detroit Pistons. Delfino could actually help this club with more minutes. What makes this team also intriguing is its increasing international flavor. Andrea Bargnani from Italy could have been Rookie of the Year last season had he played in more games. Jose Calderon from Spain ably backed up TJ Ford in the play-offs where he truly came alive. Delfino is a mainstay of Argentina’s national team. Jorge Garbajosa also from Spain provides some punch from the forward position. And there are Slovenians Rasho Nesterovic and Uros Slokar and Giorgos Printezis from Greece and Roko Ukic from Croatia who are both trying to land spots on the team. The Euro players’ sound fundamentals and court intelligence really opened up the game for the Raptors and for Bosh to dominate in the paint. And with the team having tasted success despite last year’s problems, imagine what their better team chemistry will bring. Chris Bosh was fantastic in the play-offs as he really stuck it to the New Jersey Nets. The Raptors’ franchise player who elected to stay in Toronto rather than move out, missed out on the recent FIBA Americas after suffering a foot injury that sent chills down the spines of the entire Toronto organization. The team has been so snakebit in recent years with injuries to key personnel that they cannot afford another letdown of a season. More so now that they have the right mix of players who can challenge for an NBA title. Bosh is said to be convalescing well and ready for the new season. Just as Bosh is important to the fortunes of the Raptors, former number one pick Andrea Bargnani, now that he’s healthy, will make this team harder to beat. Bargnani brings a versatility to this team with his all-around savvy. Not only does the Italian national see the floor well but he also makes good decisions with the ball. He can stroke it from three-point territory and can finish the break. It’s like playing with another point guard on the floor. He gave a glimpse of what he can do with three strong games towards the end of the play-offs when he scored 17, 18, and 16 points in a series loss to the Nets. Jorge Garbajosa who has recovered from the leg and ankle injuries that derailed him last season could inherit the departed Morris Peterson’s 3-spot. Garbajosa did not play for his native Spain in the recent FIBA tournament for precautionary reasons and should be up to full strength by tip off time. With TJ Ford and Jose Calderon alternating at the point position, there will be no let up as both can get inside the lane and make some nifty zips to the bigs lying in wait. If the defense tries to slam the door shut, Kapono will be waiting in the wings to bury them. The Raptors should have a good account of themselves as they’re a balanced team that can hurt opponents inside and outside. Juan Dixon will probably see fewer minutes so it’s important for him to stroke it well if he wants to find a place in the backcourt rotation. Maceo Baston, Anthony Parker, Luke Jackson, and Rasho Nesterovic should provide some good minutes for the starters. Parker provided the Raptors with some solid play in a bench role last season. If Garbajosa can’t hold up, pencil him in to start. The defending Atlantic champs didn't need to make major changes. But adding Kapono and Delfino was a good move as any by Colangelo. Expect the Raptors – barring any injuries to its starters – to make a serious run for the Eastern crown. 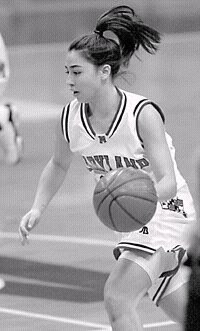 Special thanks to Odette Velarde of adidas Philippines for sending this picture. I was supposed to interview Gec Chia the other week but I was in Thailand. I'll be posting the adventures there in the non-sports blog late this week. You guys just have to read one story there. It moved me a lot and I do hope it moves you as well to do your part. I have some deadlines to finish up. If I do interview Gec it's going to be next week. That promised Blue Eagle update will be up next week as well. I'll meet up with team officials when they get back from Bacolod. And there's that unfinished Ford Arao tribute vid. Next week, les bleus! I don't think I'll be able to do PBA stuff (not formally at least but will try to write something when I do get to catch the games), but definitely PBL. I'm waiting for Commish Chino Trinidad to get back. Thanks for reading. Hi to our friends in Hong Kong, Australia, the Netherlands, UAE, Qatar, and Guam. The New York Yankees’ season despite all the feel-good moments by Alex Rodriguez, Joba Chamberlain, Shelley Duncan, and Andy Pettitte, went for naught as they were upset by the Cleveland Indians 3-1 in the American League Division Series. And about 45 minutes after the game ended and the last of the Yankee faithful had cleared the Stadium, the triumphant return to greatness of major league baseball’s greatest franchise that began in 1995 ended in the toilet after three consecutive years of first round flame outs. When beleaguered skipper Joe Torre, a native New Yorker who won four of the six World Series in which his team played in, entered the executive’s bathroom, he saw none other than team owner and nemesis George Steinbrenner inside. There were no other urinals free except for the one next to the man they call “the Boss.” As it was, everyone inside was quiet whether out of sadness for the latest team debacle or because they could tell that Steinbrenner was simmering. But when Torre entered, everyone inside could swear that they could have heard the last call topside for the 11:15pm bus to Jersey City from Port Authority. There was a curt acknowledgement from both men, but the tension was so thick that the enmity could be felt. A couple of days later, Torre turned down a one-year contract offer (for $5 million plus an additional $3 million in bonuses that largely depend on the team’s performance) citing that he felt disrespected since it effectively made him a lame duck coach. Now it’s all uncertain in the Bronx as the team looks to rebuild -- pitching coach Ron Guidry has been all but fired, closer Mariano Rivera has verbally tied any further association of his to Torre’s stay in New York, pitching star Andy Pettitte could depending also on the roster moves exercise his option to forego the second year of his contract, Rodriguez who is clearly playing a money game has probably played his last year in pinstripes, and catcher Jorge Posada who is the team’s heart and soul is a free agent. Also playing perhaps his last year is Roger Clemens for whom it is most possibly the end of the road. Since starting off the new millennium by beating cross-town rivals the Mets in 2000 World Series, the Yankees lost in two championship matches and five play-off series including the humiliating loss to the Boston Red Sox in 2004 where they spotted their foes a seemingly insurmountable 3-1 lead before suffering the most ignonimous of meltdowns. Looking at it objectively, despite the success, they’re grounds for the manager’s termination as he clearly hasn’t been able to get the team over the hump. And it isn’t like the team hasn’t been given the players the team needs to compete as they’ve signed up expensive free agents like Randy Johnson, Johnny Damon, Bobby Abreu, and Alex Rodriguez. So when does objectivity and rational sense supplant nostalgia? When is it time to blow up the team and start anew? Yes, I’m not exactly a fan of sports being business propositions, but I do understand why there are. Some would point to the Boston Celtics of the 80’s as an example of keeping a team together far too long. When they won their last title in 1986, they didn’t even have the best team. They had the best six players and that was enough to get them past many teams that season. Clearly those six players played too many minutes and it told on them heavily over the next couple of years. There was a time when certain quarters called for the breaking up of the Big Three of LarryKevinRobert but Celtics patriarch Red Auerbach vetoed any such deal. The Big Three would make it to the NBA Finals one more time in 1987 where they lost the 80’s rubber match with the Los Angeles Lakers. After that, save for the excitement of 1991, they lapsed into an extended period of mediocrity until the one-year aberration of the Antoine Walker and Paul Pierce partnership. As stubborn as Boston’s hierarchy was, they did try to rebuild with youth, but they lost Len Bias and Reggie Lewis to tragedy. They couldn’t reload since McHale and Bird retired because of nagging injuries and the Chief was well… the oldest player in the Association by then. Only the Chicago Bulls’ Jerry Krause thought that Robert Parrish could still contribute as he signed him for the team’s ’97 campaign that resulted in a fourth championship ring for the big man from Centenary. In 2005, Liverpool FC was ready to go in a new direction. They had done well with Gerard Houllier when the team won five trophies in six months in 2001 but they regressed after that in spite of the free agent signings of Hadji Diouf, Harry Kewell, and Alou Diarra. Their best finish was third place in the Premiership and they would get no further. The losing begat booing and it was clearly a time for change after the 2004 season. With Houllier and his lieutenants (Sammy Lee and Phil Thompson) out, even incumbent captain Steven Gerrard thought about bolting. But Liverpool management held firm about the change. They brought in former Valencia coach Rafa Benitez (who was fresh from a La Liga title) himself and they immediately won the Champions League and the UEFA Super Cup. The Reds would go on to win the FA Cup and the Community Shield the following season. 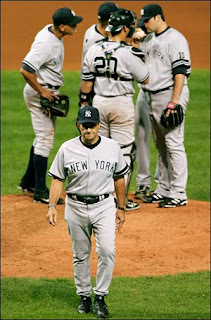 So maybe to Yankee fans like me, maybe we should look on the bright side now that the Joe Torre era has ended in New York. Yes change is always frightening; the move from the familiar to the unfamiliar. But like his equally pedigreed predecessors Casey Stengel and Joe McCarthy, good things happened to the club after their time was done (whether premeditated or prematurely) or when the season went down the toilet. From the toilet to the sewer. Just when you think it couldn’t get any worse, a part of the San Siro stadium will be closed for Inter Milan's next Serie A home game as punishment for offensive banners their fans displayed during Napoli's visit two weeks ago. "Inter Milan fans grouped in the second tier of the north stand displayed several large banners with statements insulting Naples supporters and, above all, their city of origin," reported the Italian Soccer League in a statement on its website lega-calcio.it. In the second half chants of a similar derogatory tone were heard from the same sector of the stadium while one of the banners read: 'Naples, Sewer of Italy'. As a result the second tier of the San Siro's north stand, the Curva Nord, will be empty for Genoa's visit on Oct. 31 and the football club was also fined 30,000 euros. Thanks for the great game, Vicki! Thanks for playing for the Philippines, Vicky! Our RP Women's team lost to Thailand in the gold medal game in the SEABA. But silver's not so bad! Congratulations to all and our three Lady Eagles -- Tin Chua, Pipay Villanueva, and Cassie Tioseco. And to the coach, former King Eagle Fritz Gaston. Phone interviews conducted from 10-11AM Friday morning October 19, 2007 courtesy of adidas Philippines. Muchos gracias to Odette Velarde. Rick: Hi, Keyon. Good morning, sir. This is Rick Olivares. Keyon: Hi, Rick. Ah, you don’t have to “sir” me. I feel old (laughs). But good morning to you too! (laughs). Thanks for taking the time out to talk with me, man. Rick: Hahaha. I assure you the pleasure is mine being a basketball fan. But that “sir” is all about respect. Keyon: Thanks. (laughs) That’s cool! Rick: So Keyon, how’s Macau? Keyon: Oh man, we should have been here like 30 days ago! We just arrived but its been fun. Macau is beautiful. The sights, the shopping, the restaurants. It’s a whole different place over here. We just love the atmosphere. It’s a perfect way to jump-start our season. Rick: Last year, the Magic finished with a 40-42 record. Do you think with your new additions you’ll be able to finish better and go a little deeper in the play-offs? Rick: You did. Maybe thrice already! (laughs) Every season, I know you try to work on your game. So what are you prepared to bring to the Magic this campaign? Keyon: Well, basically I try to get better in my shooting and ball handling me being a guard. With Dwight getting better every year, I’m hoping for more open looks at the basket. (laughs) But one of the most important factors is getting rest. Lots of it. The NBA is one long season and sometimes you have to play through injuries. You really have to pay attention to your body, your health. Traveling to places like Macau helps. Seeing new places and meeting the fans. It’s always a good experience. Rick: How big a loss was Grant Hill for your ball club? Keyon: Anytime you lose someone of Grant’s character, it’s a big blow to the team. 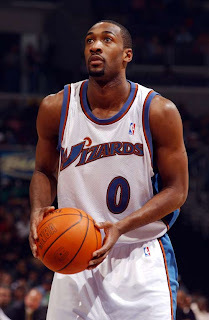 But we got another solid player in return… Rashard Lewis. But you know, we take it as a challenge and everyone’s ready to step up. Do their bit for the team. But we miss Grant definitely. Hope he’s happy in Phoenix though. Rick: Thanks for your time, Keyon. The best of luck this coming NBA season! Keyon: Hey, thanks for the chat. It was fun. You should come here, buddy! Rick: I was there about two months ago. And I certainly wish I was there right now. Keyon: Well, next time then. See ya around, Rick. 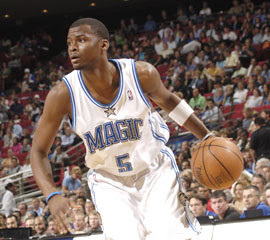 KEYON DOOLING MISSED THEIR LAST COUPLE OF PRE-SEASON GAMES BECAUSE OF AN INJURY. HE'S OUT ALONG WITH TREVOR ARIZA AND RASHARD LEWIS. Rick: Hi, Hedo. This is Rick. Thanks for sparing me a few minutes. Hedo: Yeah, hi. No problem. Rick: How is it going with you? Rick: So how’s Macau so far? Hedo: We just arrived yesterday and all we’ve seen so far is just the hotel, the casino, and the restaurant. I wish we could have time to walk around and see Macau. It looks like a nice place. Rick: (laughs) Yeah, it is beautiful and I hope they do let everyone go around for some sight seeing. Rick: Do you think it’s been a short summer for you since you all competed in the Euro basketball tournament? Hedo: Well, everyone would like some more rest, but after a bit, you start to miss picking up a basketball. So we rest when we can. I can’t wait to go around and take pictures you know. Rick: So how’s the Magic this year? You lost Darko and Grant. Do you think you have the additional pieces to compete this season? Hedo: I think that the three new guys will help the team (Rashard Lewis, 6'10" Polish center Marcin Gortat, and coach Stan Van Gundy). We’re also learning a new system from Stan Van Gundy. He’s a good coach who knows how to work with the players. He brings a winner’s touch to the Magic. He won in Miami. Even the team that won the championship was also because of him. Rick: With some scoring from the forward position gone with Grant’s departure, do you think there’s a little more pressure on you to score? Hedo: It’s not just scoring where I can help the team. Stan emphasizes playing defense so that means rebounding and stopping your man… all that stuff. What the coaching staff feels our roles should be, then we all have to adjust to it if we want to have a successful season. Rick: It seems like this early you’ve given Stan Van Gundy a stamp of approval? Hedo: (laughs) He’s a good guy and a great person. More responsibilities means that he trusts me. And I like a challenge. So I hope to get better and help the team get better. Rick: Last question, what do you think of the Orlando Magic’s chances this season? Hedo: It was an off-season was busy. We brought in new guys. And the others are coming back in better shape and with a better game. Dwight (Howard) is pumped up. He won a gold medal. (laughs) I’m pumped up. I think we’ll do well. Rick: Good luck, Hedo. And it was nice talking to you. Hedo: Ah, thank you and good luck. (to another person) When do we go shopping? 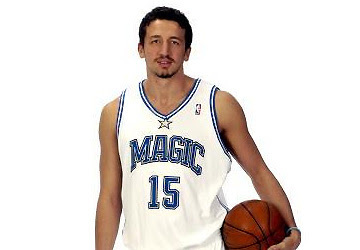 HEDO TURKOGLU SUFFERED A MILD ANKLE SPRAIN IN THEIR GAME THAT EVENING AGAINST THE CHINESE ALL-STARS. Sometimes all you need is a little patience. The Charlotte Bobcats are building something exciting here their record notwithstanding. Owner Robert Johnson and General Manager Michael Jordan like what they see and rather than break up the youthful core, they locked up their young stars for a serious run and added a veteran scorer who should provide plenty of excitement for their team. There was early speculation that Johnson would tighten up with his expenses something that’s a no-no in sports for it turns off the fans and frightens away potential free agents who can really help a young team like the Bobcats. But Johnson came through to provide the new franchise with its best line-up yet. Enter another #23 in Jason Richardson who after years of carrying the dismal Golden State Warriors suddenly found himself lost in the shuffle when Don Nelson turned to Baron Davis, Stephen Jackson, and Matt Barnes to lead the team. He joins the dynamic core of Emeka Okafor, Gerald Wallace, Matt Carroll, Primoz Brezec, Adam Morrisson, and Raymond Felton that is a year older and wiser. The Bobcats have gotten better every year in the league hiking their inaugural win total of 18 in 2004-05 to 26 the following year and to 33 last year. That translates to a team that is learning and getting more comfortable with each passing season. The Bobcats have drafted wisely investing in players who not only come from winning college programs but also have brought their teams to the NCAA Finals. There’s Okafor who won a title with UConn (with the Chicago Bulls’ Ben Gordon), Raymond Felton and Sean May who won at the University of North Carolina, and Adam Morrison who single-handedly carried the Gonzaga Bulldogs in the 2006 NCAA season where they ultimately fell to UCLA in the Sweet Sixteen. But also a huge part of Charlotte’s success is due to its coach Bernie Bickerstaff who had brought up his young players nicely. Unfortunately, the former Seattle coach will be moving up to a front office job so he won’t be able to guide his wards on their fourth campaign. Point guard Brevin Knight who provided sterling leadership and poise off the bench is no longer around as well. Stepping into the breach is first-time coach Sam Vincent who won a championship ring with the Boston Celtics in 1984 and was a teammate of Michael Jordan’s for a couple of years. So the jury’s still out on Vincent. Primoz Brezec and Emeka Okafor are solid inside and don’t just take silly shots. In fact, they are among the leaders in field goal percentage. And they’re getting plenty of help from Sean May who should be a solid contributor soon as well as from 11-year veteran Othella Harrington and Argentinean Walter Hermann. Gerald Wallace is the kind of player you’d like to have on your team for his selfless dedication to getting better and playing both ends of the court. His zest for the game has been a positive for this team and will surely rub off on the rookies. Adam Morrison came to this team with high expectations. There were days when he could light it up, but in his one year in the pros, he’s experienced more losses than his entire stay with the Zags. Only now, he should get better after having finally adapted to the pro game. Although Ray Felton has been the team’s starting court general for a while now, they will feel the loss of Knight who went to the Los Angeles Clippers. Knight ‘s leadership under fire was crucial. In his place is former New Jersey Net Jeff McInnis who seems to have fallen out of favor with every team he has played with. In the shooting guard position, they have considerable firepower with super sub Carroll, Derek Anderson, and Jason Richardson. These guys are fun to watch. 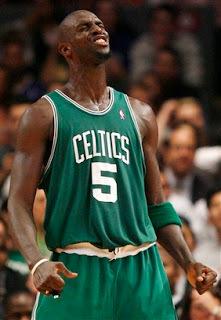 KG has added an infectious dose of enthusiasm and energy to this long downtrodden ball club. Ainge, ya finally did right. Joe Torre rejected the NY Yankees' $5 million one-year offer officially ended his time in pinstripes. Who will be the next manager? Either Donnie baseball or Tony LaRussa, IMHO. If you're wondering why Torre rejected the offer, it's because the one-year contract renders him a lame duck coach. Subject once more to threats and speculation. Should there be any malcontents on the team, they can razz the manager no end without fear of reprisal since he'll be out any way. So good move, Joe. And from the bottom of my blue and pinstriped heart (there's ome LFC red in there too), thanks! Grazie per il vostro tempo, a New York. E 'stato un giro fantastico. Pako Ayestaran, Liverpool FC's long time strength and conditioning coach, is leaving Anfield. Holy crap! He's been with Rafael Benitez since they were in Osasuna in the Spanish La Liga. He grew up watching Liverpool win back before the English Premiere Leage was set up. In fact, he was one of those who pushed Benitez to try his luck with the Reds and in England. He's more than a fitness guy; he knows his football and is a great confidant to the players. Damn it all. It seems that there's been a rift with Benitez regarding infringement of responsibilities and a near return to Valencia for Ayestaran at the end of the last season. And it has come to a boil this year. It's sad because when you think about it, these guys have been together for like 11 years now. Although they've been more successful in the EPL, they kicked off their winning ways with Valencia where they won a La Liga title. Thanks for everything, Pako! 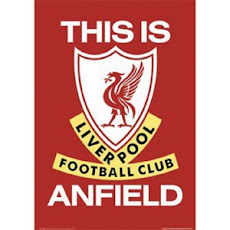 YNWA! I first met Zion Laterre back when he was in Team B. When a decision was made to help manage Gabby Severino's outfit, we identified a few players who could possibly move up to the UAAP team and see how we can help them. Zion was one of them (along with Mike Baldos, Jeff De Guzman, Zach Estoesta, and a few others). Guys like Raul Banzon chipped in by giving them some free use of their Plyometrics training at the Fort. Others like Jem Bengzon gave valuable advice on how to go about helping the team. 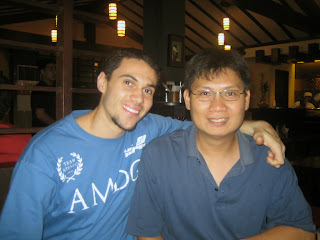 Paolo Trillo and Mr. M were most gracious in assisting us and making sure we complied with team rules. And of course, Fr. Tito Caluag was there to shepherd us along. Zi played a somewhat different game back then. He had more of an attacking style that we all thought we be an asset to any team because of his boundless energy and athleticism and a commitment to defense. He's never dunked in the UAAP, but if you watched him back then, you would have all been reminded of Rich Alvarez. There were some pretty nasty slams back then, bro. With his basketball IQ, we knew it wouldn't be long before he was elevated. 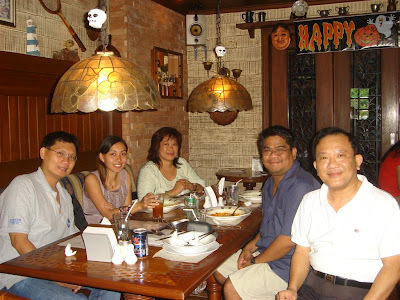 So when Zi and Eman Nazareno made it the following year, we were ecstatic. Now that Mike Baldos has followed suit all that hardship definitely was worth it. The program works and they've got some pretty good coaches over there. But there were a few others who would have been real cool to see play in the senior circuit. To see them go to the games and cheer their former teammates on is gratifying. To Zach, Harry Hipolito, Gino Villame, Chester Chavez, and Jeff, it was sure nice to see you up in the stands cheering the team on. I'm no longer involved with Team B but I had a chat with Tonino Gonzaga (during the celebration for the Lady Eagles) who has been tearing up the competiton along with guys like Jeff and Enzo Katipunan in the Fr. Martin II. Like I told you, bro. Just hang in there. Good things come to those who wait and do their best at all times. Last night, we had dinner at Omakase in Libis. Catching up on the just-concluded season (we had a lot of stories to swap that we cannot post here for the moment) and the future. Zi will probably leave for Australia this mid-November. He's finally done with school and should come back in time for graduation. Since the UAAP games ended, he plunged into his studies and caught up with all his final requirements. He'll be practicing with his hometown team the Townsville Crocodiles in the National Basketball League and try to land a spot on the roster. The team told him to finish his college education then come back. Dude, it's been like what... four years? Congratulations to you and Karla (she's due to give birth to a baby girl this coming January 2008). Those were some mighty fine hoops days when the team and its supporters walked the streets of Recto after a game in search of something to eat. Taking the LRT and dashing through the pouring rain to find shelter. Man...the UAAP may be more memorable, but as a good friend of mine once said (photog Joseph Nocos), that time in Team B built character. Best wishes, bud. Maybe we'll see you and Karla in New York next time. She retired her match against Italian Francesca Schiavone in the Zurich Open due to a thigh injury. This is going to prevent her from landing a spot in the season ending WTA Championships in Madrid in a few weeks. Anyways, belated Happy Birthday to the #10 ranked Women's Player in the World today. Time for Another Bull Run? The votes are in. We had 42 respondents. 18 voted yes to break up the Bulls' core and trade for Kobe. 24 said no coz the team is finally mature and ready to ascend. The Chicago Bulls can no longer claim to be a team on the rise. The youth movement that General Manager John Paxson put together over the last five years is ready to ascend. Now. Of course Paxson knows that all too well after his Bulls were eliminated three consecutive times by the Detroit Pistons before they won it all in 1991, their first of six NBA titles. The window for an NBA championship is open only for a few years and if teams fail to make the move then they run the risk of being a middle-of-the-pack unit. Case in point: the Cleveland Cavaliers of Mark Price, Larry Nance, Hot Rod Williams, and Brad Daugherty. Magic Johnson towards the end of his career pronounced them as the team of the 90’s. Only no one gave Michael Jordan’s and John Paxson’s Bulls enough respect. Chicago not only ended the Cavs’ title aspirations, but they shook the entire franchise to its core. But then again what teams didn’t those Bulls of old dismantle? The list is endless. And now together with Coach Scott Skiles, they have assembled a team in their likeness. A bunch of gym rats who can shoot from everywhere on the court and are Rottweiler feisty and scrappy. 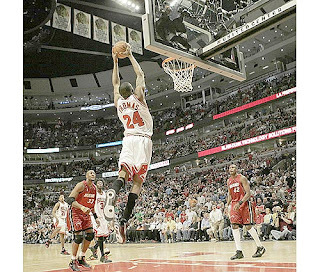 Some basketball observers noted before last season commenced that the Bulls would have been better served had they held on to Tyson Chandler rather than sign Ben Wallace. Chandler has blossomed quite nicely in New Orleans and has finally lived up to all that potential hung on him by former Bulls’ GM Jerry Krause. Big Ben’s lack of an offensive game is never going to attract the double team that will free Luol Deng or Ben Gordon. Deng had his breakout season last year while Gordon is officially now the east’s hottest scoring two guard since Allen Iverson was shipped to the Continental Divide. Early on the Bulls underachieved because of the weight of expectations and it took Headband Gate to put the team on the same page. An injury to Andres Nocioni put a little cramp on the team goal of 50 wins (they were one short). And that one loss changed the play-off picture as Cleveland got a free pass into the NBA Finals while the Bulls experienced a letdown by the time they faced the Detroit Pistons in the semis. Skiles and his Bulls know that had they played a little better they would have advanced to the Finals. The team could have added Pau Gasol or even Kevin Garnett but the price was too steep for Paxson as he would have decimated his young core that was getting better every year. 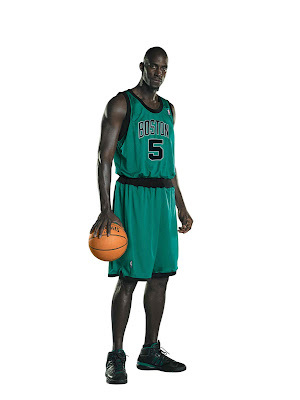 You can bet that Johnny Jumpshot will be paying close attention to Boston and how far Garnett will take them. With Kobe Bryant still available, I wouldn’t be surprised if he pulls the trigger on a massive trade to bring maybe the one player who can almost single-handedly bring the Bulls back to prominence. The addition of Joe Smith is well… not bad. He’s a younger version of PJ Brown who plays good defense, provide locker room leadership, can rebound some, take charges, and knock down the mid-range jumper. Now hopefully he’ll play with a lot of heart. The team’s rebounding totals got better with the addition of Ben Wallace as did their blocks and interior defense. Anyone remember his opening day block of Shaquille O’Neal’s slam attempt? That was Ben welcoming everyone to his new domain in the Windy City. Andres Nocioni when he’s healthy is a handful. Tall and strong enough to muscle with the big boys, he’s also agile and smart enough to draw them to the perimeter where he can hit the three or drive by them for a dunk. The health of the Wild Bull of the Pampas will also spell how Chicago fares. Tyrus Thomas can only get better. He’s been working on his jumpshot. Once he knocks that down with consistency then Skiles will have his younger version of Amare Stoudemire. I guess the same can be said about Joakim Noah. We know he’s got heart, but offense? He didn’t play much in the summer leagues because of a torn rotator cuff. If he misses the season, he’s also missing out on an opportunity to contribute immediately. If he is able to play with a Rodmanesque ferocity watch out. Who knew Luol Deng would be this good? I thought he’d be a marginal player since he wasn’t this explosive at Duke. But like everyone else, no one took into consideration his fighting heart and willingness to work hard. It would be interesting to see what he worked on this summer. Chicago might have one of the smaller backcourt combos with Kirk Hinrich and Ben Gordon but their defense isn’t something to laugh about. Now if only Captain Kirk can stay away from foul trouble. Scoring is not a problem here as the trio of Hinrich, Gordon, and Chris Duhon averaged 45.2 points per game. That’s a little under half of the team totals of 98.8 ppg. The frontcourt duo of Luol Deng and Andres Nocioni accounted for another 32.9. So from their bench scoring was thin. If the Bulls’ guards can set up their frontcourt players for dime drops or gimmes this will make them more difficult to stop. The much-maligned Chris Duhon despite coming off the bench was second in assists and provided steady scoring. Chicago for all of Michael Jordan’s or Ben Gordon’s spectacular scoring sprees has always been a defensive-oriented team. 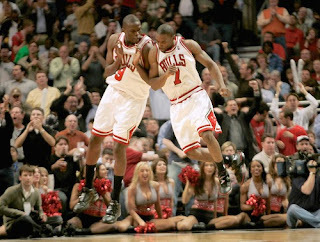 The 2006 Bulls bettered their numbers in rebounds, steals, assists, turnovers-to-assists ratio, and scoring. They could have run roughshod over the East had they been healthy all season long. As it is, only Gordon and Deng played in all 82 games. What kept them going was their bench depth and if Joakim Noah and Aaron Gray contribute right away and Nocioni’s back holds up, this team will advance deep. Should the team falter in the early stages, look to Paxson to make a blockbuster trade to bring Kobe Bryant or Pau Gasol finally to Chicago. The Bulls lost on the Kevin Garnett sweepstakes and now they have another eastern contender to deal with. Money says that Paxson won’t make the same mistake twice. Unlike Boston, the Bulls have plenty of young talent to pick up the slack. Liverpool supporter. 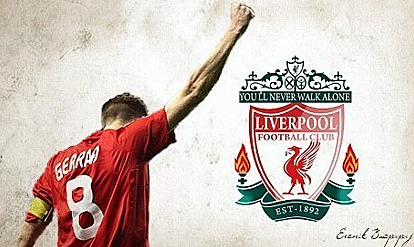 Win one for the Kop, gentlemen! "In 1978, the year of Liverpool's second European Cup victory, just as in 2005, a Pope called John Paul died. Then as now, Wales had won a glorious rugby Grand Slam. In both years, the winner of the English League had beaten Liverpool in the final of the League Cup: Nottingham Forest and Chelsea this season. In 1981, Prince Charles married Diana Spencer; in 2005 he got hitched to Camilla Parker Bowles. In 1981 and 1985, Norwich City and Crystal Palace both were relegated. Most amazingly, in 1981 and 1985, Liverpool only won 17 league games and ended up in fifth place. Finally, they won all four of their European Cups wearing red while their opponents wore white." There was one more mentioned but it's a British concern that none of us may know about. But isn't this kind of freaky? Was the title pre-ordained? 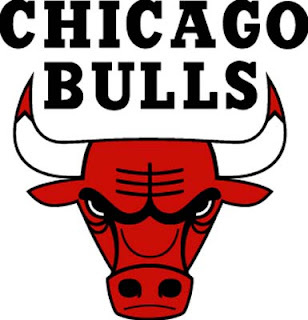 Several years ago, I compiled something very, very similar to the Chicago Bulls. One that also involved numerology. I'll try to dig that up wherever the heck that is. But that was pretty amazing too. I know that La Salle had theirs this year. Anyone else know other similar "coincidences?" 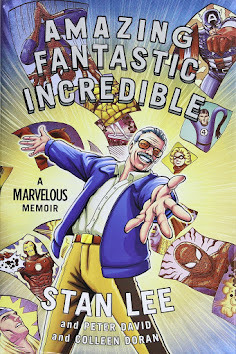 I picked up this book at Kinokuniya at the Siam Paragon Mall in Bangkok. 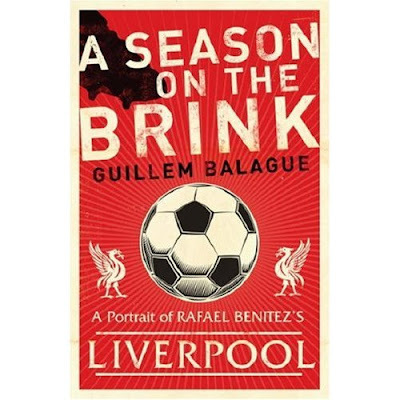 A great read that bridges Gerard Houllier's last year and Rafael Benitez' spectacular first season with the Reds. Expertly written and a must for all football fans. I just bought a few reading materials; this and two magazines. Spanish expat, Balague who lived in Liverpool for quite some time has the inside story of that most memorable campaign that culminated with a Champions League victory over AC Milan (of course, Milan returned the favor this year in Athens). I am somewhere in the first 75 pages and will post an interesting excerpt on the "coincidences" and signs of a Liverpool victory tomorrow. 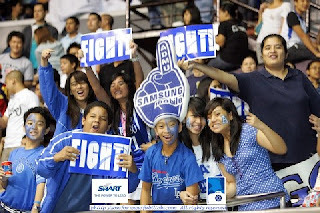 It’s only in the Philippines where the global brands allow their focus to shift from football to basketball. There’s a fledging hoops scene in Thailand but the dominant sport here is football. Along the BTS (sky train) that runs across the Sukhumvit Road (one of the longest in the entire world as it stretches from Bangkok all the way to the border of Cambodia), there are several billboards of the retired (for more than a year now) Zinedine Zidane promoting adidas. In the mall, there are billboards and posters of Liverpool, David Beckham, Barcelona, Ronaldinho, Wayne Rooney, and Francesco Totti among a few. There are a couple devoted to their national team currently ranked at #126 in the world. In contrast, the only other athletes I’ve seen so far in Bangkok are Tiger Woods, Michelle Wie, Roger Federer, Maria Sharapova, and LeBron James. That’s two apiece for golf and tennis and one for basketball. In the Tokyu Department Store right next to MBK (something very similar to Market Market only way better), they have a whole section solely devoted to Manchester United. Authentic football jerseys sell for around 2,200-500 baht. At Centre World, they have an Arsenal store (they still haven't gotten used to Thierry Henry not donning the Gunners' jersey anymore because a larger-than-life shot of him and Cesc Fabregas guard the outside of the store). The adidas stores are primarily described as “Liverpool” stores since they’re awash with posters, streamers, scarves, and jerseys of the football club. There are few club favorites available but if you’re looking for knock-offs, you’ll find them and all the big names from Zlatan Ibrahimovic, Kaka, Shevchenko, Ballack, Robinho, Van Nistelrooy to even unlikely names such as Pipo Inzaghi, Torsten Frings, and Jerzy Dudek in MBK or Chatuchak, the weekend street market at the end of the Sukhumvit BTS line. They sell from anywhere from 200-650 baht but be ready to haggle not just for the jerseys but for anything you want to buy. In Thailand, they’re also lucky to get some of the big club teams to visit during the pre-season. When their national team plays, they pack the national stadium. They have two football divisions to watch and support. Cable channels? They have several devoted to sports with some football channels showing everything from the Serie A, Bundesliga, La Liga, Premiere League, and Asian football (don’t worry, they also get a lot of NBA games).